If you've never heard of the America The Beautiful National Park Pass, you're in the right place. Or maybe you have it already, but want to know how to max out the benefits this annual pass provides for hikers and campers. Still in the right place! Let's tackle the most frequently asked questions, shall we? In the United States, federal recreation sites managed by various national government agencies may require you to pay an entrance fee in order to go hiking, backpacking or camping. The fees are used for staff salaries, maintenance and repairs to enhance your experience as a visitor. This pass covers all of your visits to federal rec sites in one calendar year, more than 2,000 places at last count! So what's a federal recreation site, anyway? These places have a wealth of hiking opportunities, along with campgrounds for establishing a base camp. And some national parks have trip-of-a-lifetime hiking and backpacking trails, such as the Wonderland Trail in Mount Rainier National Park. It would be hard to run out of places to hike in these sites! Here is a free pdf list of all federal recreation lands where you need a pass to enter (and you can purchase one right there on the spot). This list is also great for scheming and dreaming up your bucket list for hiking. Two things come to mind immediately: time and money. Since both are important to hikers and backpackers, let's take a closer look at what this National Park Pass can do for you. If you've ever waited in line for admission to anything, you know that the person in front of you who needs to fill out paperwork or get a credit card transaction to go through is going to take up more time than if they had a pre-paid ticket. The same holds true with this park pass. Pay for it before you leave home, flash the laminated plastic card at the entrance, and you'll sail on through in no time flat. Cost savings is another big reason for having a park pass. This covers all of the ways you can gain entrance to the park for your visit: a non-commercial vehicle, motorized bike, on foot or via a bicycle. You can also purchase a Mount Rainier Annual Pass for $55, allowing you to return again and again to that park for 365 consecutive days. But just that one park. Now let's look at what the National Park Pass costs annually. At the time of this writing in 2019, the annual pass costs $79.99. Compare that to the Mount Rainier annual pass at $55. You can pay 69% of the National Park Pass just to get into one national park. If you plan to focus all of your hiking in one place, that might make sense. But if you're going to wander around a bit (and I sincerely hope your hiking plans are to do just that), you're going to have to pay an entrance fee to each and every national park on your list. Let's say that in addition to Mount Rainier, you want to explore the Grand Canyon. Are you beginning to see that purchasing one annual park pass makes sense for your travel budget? Purchase the pass as close to your travel dates as possible, because the annual clock starts ticking once you buy it. Example: You have trips planned for early June, but you go ahead and purchase the pass in late February to cross it off the "to do" list. It's valid only through the following February. So a smart move is to purchase it at or near the end of May for your June trip. It will be a valid entrance pass through the end of May the following year, allowing you to get in some spring hiking on federal recreational land. So time your purchase appropriately, with a fudge factor for having the pass mailed to you if you don't purchase it in person. There are no automatic download options following your on line purchase at this time. by this annual park pass? You as the buyer of the pass are covered. But there are some benefits for hiking companions that you will appreciate. If you're arriving at the entrance in a non-commercial vehicle, as the driver or as a passenger, you will be admitted with the pass along with up to three other adult trail buddies. Kids under the age of 16 years are granted free admission to these federal recreational areas. If you're in a vehicle with more than 4 adults and want to enter certain areas, per-person fees will be charged for the "extra" people if entrance fees are calculated in that way. On a motorcycle and traveling with another motorcyclist? If you both show up at the entrance simultaneously, your pass will grant your friend on the other motorcycle free access. You'll need photo identification such as a driver's license to verify your ownership of the pass. And in my experience, yes, they do "card" you! Be sure to sign the back of the card, using the signature that matches your photo i.d. This verification process also means you can't let a friend borrow your pass, or transfer it to someone else for a hiking trip, unless you're along for the ride. One convenient place to make your purchase is REI Co-op. On line is really easy, and you'll receive your pass within a few days by mail. REI donates 10% of its sales from the pass to the National Park Foundation. If you're already a member of the co-op, your pass purchase won't qualify for the annual rebate (because it's a federal pass). But there are many reasons to make your outdoor gear purchases via REI. 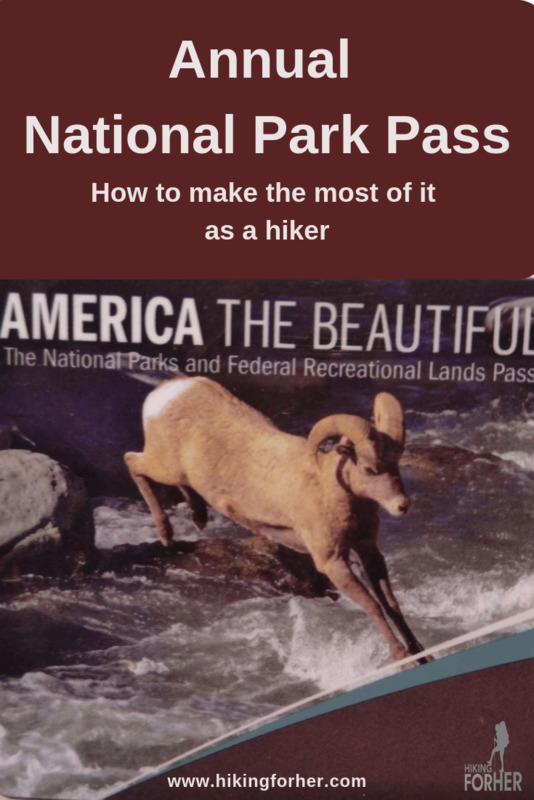 You can also purchase the pass directly from the National Park Service. Allow plenty of time to receive the pass if you use the NPS. Heads up: If there's a government shutdown either looming or in effect, your pass won't get to you for the duration of the work stoppage. The federal websites will also be shut down, cutting off your ability to purchase the pass. But then again, you might not be able to gain entrance to the federal lands during this situation, or (best case scenario) you won't have to pay to enter. There's no predicting how long a shutdown will last, and you'll be needing that pass when the entrances open up again! So don't get caught short. As mentioned above, there is a list of sites which offer the pass for sale at the entrance. This can be a risky strategy. You'll need to pay by cash, check or credit card and fill out a form. Time you could be hiking! Also, there is no guarantee that a pass will be available for purchase at the entrance. That means you'll have to pay the day entrance fee rate, which makes the math less favorable for buying an annual pass. And what if you didn't remember to bring the check, or don't have the right amount of cash? Plan ahead to save some time, and money, not to mention aggravation. You must celebrate your 62nd birthday before you can buy the pass. And yes, you will be asked to verify your age when you apply for this lifetime pass. In addition to providing documentation of your age, you'll be asked to verify your residency or citizenship. When I purchased mine, I had to send a photo of my driver's license and supply a personal identification number. The cost of a Senior Pass is a one time fee of $80. Lifetime access to thousands of federal recreation sites around the United States for $80?? Note that you can buy an annual Senior Pass instead, for the reduced rate of $20. Four years later (20 x 4), you'll be wondering why you didn't spring for the lifetime pass, right? Whoever travels with you in a vehicle, up to three adults in areas where per-person fees are charged, will get in free with this pass as well. Be sure to check if you're eligible for what are called expanded amenity benefits at the recreational sites you're hiking in. The discount may run as high as 50%. All of the free admissions plus discounts add up to big savings over the years, if you sign up for your Senior Pass as soon as you achieve the wonderful milestone of 62 years! You will also avoid future price increases, as you enjoy hiking into your golden years. If you buy your pass online or by mail (rather than at the entrance to a federal rec site), you'll be dinged an additional $10 fee. Not cool, but it is what it is. You may know an elder hiker who has one of those older passes. The Senior Pass has replaced the Passport. No worries, the Passport is still honored, but is no longer being sold. Of course there are more tips! This is Hiking For Her, source of all things hiking! Sometimes there is no human at the entrance to the federal recreation site (stay tuned for the robots). But you still need to display your annual pass to prove that you've paid an entrance fee, even when you're off on a hiking trail or lounging around at a campsite. Be sure to hang the pass from your rearview mirror, using the free handy hangtag pictured above, before you walk away from your vehicle. Or put in on your dashboard, with the signature side up. If you're a motorcycle owner, you'll get a decal rather than a hangtag. Paying for the national park pass and then forgetting it at home will irritate the **** out of you, says the voice of experience as she shelled out a day entrance fee while thinking of the pass sitting on the kitchen table. Store your pass where your hiking and camping gear is stored. Use the handy hangtag to keep it at eye level. Better yet, keep it in your vehicle or wallet. Don't be the hiker who has to leap out of the car, run to the back and begin to frantically dig through gear or a wallet to find the pass (I admit nothing). The people waiting behind you will glare, and if you happen to meet them on a hiking trail later that day, will still be glaring at you. Write yourself a reminder sticky note the night before you leave for the park: "Hey, genius! Put the entrance pass on front seat". Put the note on the bathroom mirror. If you're proactive, why not add this item of business to your gear list? It's a good memory jogger and a fool proof way to avoid slip ups. You're eligible for a free annual national park pass, to honor your service. All you need is your Common Access Card (CAC) or military i.d. to show that you are a member of the United States Army, Navy, Air Force, Marines, Coast Guard, or the Reserve or National Guard. The pdf list above will show you where to obtain a pass, or you can go to the pass website link above for more details. Instead of paying separate entrance fees to federal recreational sites, flash your pre-paid pass for 365 days no matter where you go, and save time and money. Don't wait to buy your annual pass at the entrance. The best strategy is to have it in hand when you arrive. If you decide to take your chances, at least call ahead to your desired location to determine if they have a pass they will sell to you at the entrance. Not a hiker yourself, but love that smile of happiness when your favorite hiker opens up your gift? This national park pass makes a truly thoughtful year long gesture for a holiday, birthday, anniversary, or a milestone hiking trip on federally regulated lands. Some of the links on this website take you to outdoor companies that provide high quality, trailworthy gear and clothing. You pay nothing extra when you make a purchase those the links, but you help keep these free hiking tips flowing around the globe.